Good morning Junkies! I've got quite a colorful journal page for you today. It's simple but full of texture and bright colors. To create this page, I spread Black Sand Texture Paste onto a piece of watercolor paper and then raked a Catalyst Wedge through it. Once that dried (it takes a while), I sprayed several layers of Art Anthology Heart, Waimea Bay, and Salted Caramel Colorations until I go the desired color depth. 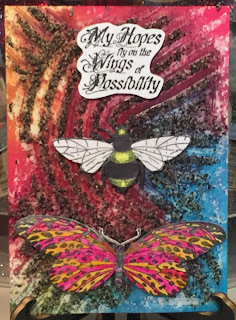 I stamped Big Butterfly, Big Bee, and Wings of Possibility onto a piece of cardstock and then fussy-cut out. The butterfly was painted with Art Anthology Dimensional Gems in Amber and Rhodolite. 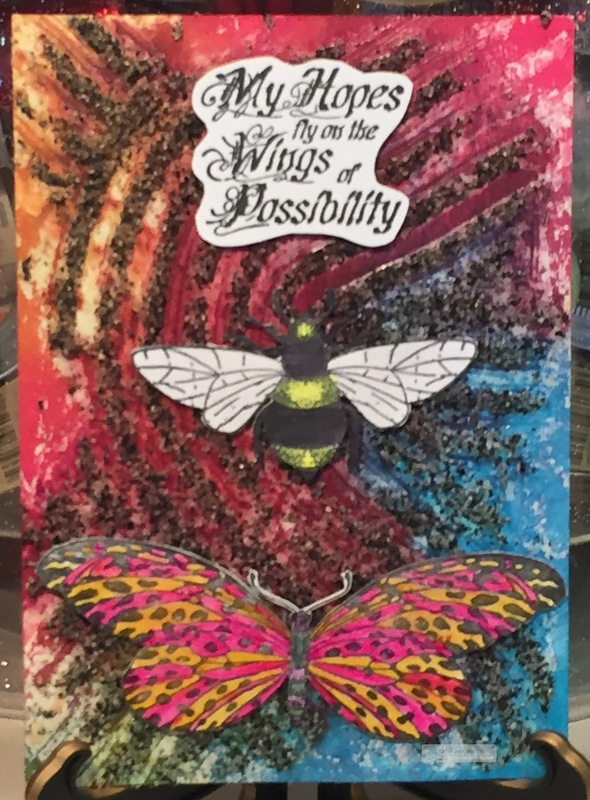 The bee was painted with Art Anthology Velvet in Lemon Tart, Tuxedo, and a mixture of Cotton Candy and Cotton (for the wings). I then centered everything and glued it down. It will make a journey to it's new home this week. Check out our website at www.techniquejunkies.com for a lot more stamps just as wonderful as these.